Some young Romans turned their training in the Circus games to purposes of war and in this way seized the lowest portion of the wall. Before the extravagant habit came in of filling the Circus with animals from all parts of the world, it was the practice to devise various forms of amusement, as the chariot and horse races were over within the hour. Amongst other exhibitions, bodies of youths, numbering generally about sixty, but larger in the more elaborate games, were introduced fully armed. To some extent they represented the maneuvers of an army, but their movements were more skilful and resembled more nearly the combat of gladiators. 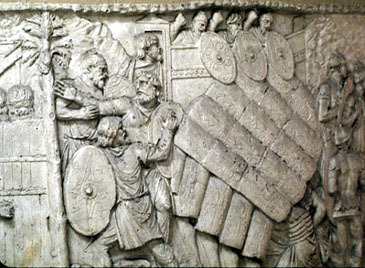 After going through various evolutions, they formed a solid square with their shields held over their heads, touching one another; those in the front rank standing erect; those in the second slightly stooping; those in the third and fourth bending lower and lower; whilst those in the rear rank rested on their knees. In this way they formed a testudo, which sloped like the roof of a house. From a distance of fifty feet two fully armed men ran forward and, pretending to threaten one another, went from the lowest to the highest part of the testudo over the closely locked shields; at one moment assuming an attitude of defiance on the very edge, and then rushing at one another in the middle of it just as though they were jumping about on solid ground. A testudo formed in this way was brought up against the lowest part of the wall. When the soldiers who were mounted on it came close up to the wall they were at the same height as the defenders, and when these were driven off, the soldiers of two companies climbed over into the city. The only difference was that the front rank and the files did not raise their shields above their heads for fear of exposing themselves; they held them in front as in battle. Thus they were not hit by the missiles from the walls, and those which were hurled on the testudo rolled off harmlessly to the ground like a shower of rain from the roof of a house. I don’t really think I believe it originated in the Circus and then was applied on the battlefield, but it certainly was a memorable, showy move!